Selling a product on Amazon can be a fantastic way to subsidise your income or, if successful, even replace it. But while it is great to have a business plan and a dream of making heaps of money, you are still going to have to get down and dirty in the Amazon Marketplace to ensure those all-important sales. It will pay to get to know Amazon and its customers intimately, as there are countless tactics and small business tips that can help increase your sales. If you are in this venture for the long run you are going to want to have a long-term strategy to refine over time, but although selling on Amazon is always going to be a learning curve, there are ways you can improve any listing. 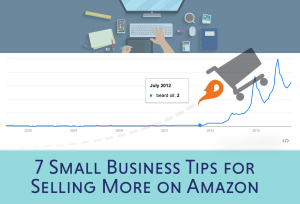 Today, we take you through 7 small business tips and practical tweaks you can make to your Amazon Marketplace business to help increase your sales. It’s a sales tactic that has been taking place since the earliest days of commerce, but discounts or special offers remain a sure-fire way of attracting customers. Discounted items will also appear higher on Amazon searches whenever customers hunt specifically for bargains, and daily deals can land an item at the #1 search position in its product category, as well as opening up the possibility for Amazon to feature or recommend the product to customers who search for or who have bought similar items. When selling on Amazon, it is often just as important to find exposure for your product via recommendations as it is to have great SEO optimisation that allows your customers to search for it. Amazon is a search engine as well as a marketplace, so understanding how SEO works for your listings can help you a lot. You should of course consider how to rank well on Google as well as Amazon, but the bulk of search traffic in Amazon comes from the internal site search, meaning that it’s recommended that you optimise for both but consider favouring Amazon’s SEO. As you might expect, there are numerous elements that affect Amazon’s SEO, including your product’s title, subtitle, description, availability, pictures, sales history and the total number of reviews. Understanding the ranking factors that Amazon considers vital help you to creep higher in Amazon’s search results, and this is something we will discuss in greater detail in a future Unlimited Success blog. In general, better-selling products tend to appear higher up on the list and as your sales increase, so does your placement. Getting reviews is particularly important early on in your product’s life, when you are trying to gain traction in the market place. 1* reviews are inevitable and the occasional poor rating can even add credibility by showing that your product and reviews are authentic, so don’t be afraid of them. Amazon has quite strict rules when it comes to soliciting reviews, so make sure that you are abiding by the website’s guidelines. In October 2016, the website updated its rules to prohibit “incentivized” reviews – in which products are given out for free in return for a review – unless they are part of the Amazon Vine programme. While this ensures that the reviewers are “trusted” rather than bribed or illegitimate, it also limits the tactics at your disposal for gaining more reviews. A simple small business tip to help increase your reviews is simply to ask your customers how you are doing by email, and ask for feedback. You should also seek to close any queries or complaints swiftly, prioritising the customer rather than your pocket, as this is a proven method of receiving more feedback. Customers will often praise a company as highly for a swiftly-solved problem as they will for a great product, so damage limitation in this way can be advantageous to the company. If you have your own brand you have a unique concept to leverage, you can launch a range of products instead of relying on just one, and you also gain more trust as a genuine company with brand values rather than a sole seller. Customers may be hesitant to purchase from you if they can get the same items elsewhere, so forming a brand is a way in which to combat this and offer reassurance that you are a legitimate, reliable business. Having a brand also makes your Amazon seller profile appear more professional and memorable, and creates the possibility of selling your business if it proves successful in the future. This is the box that appears on a product detail page where a customer starts the buying process by adding an item to their basket, and having your product appear here multiplies the likelihood of each customer buying from you. The Buy Box winner is selected from a pool of eligible sellers offering the same “new” product, and while there is no way to guarantee that your page will be the one chosen to appear in the Buy Box, there are ways to increase the likelihood. Some of the metrics that Amazon considers are that the item is competitively priced (including the delivery rate), that the item is currently available, your shipping times, and your seller performance metrics such as customer feedback ratings, delivery history, and how quickly you reply to customer queries. As there are many metrics that Amazon considers, the Buy Box is something of a holy grail on the Marketplace, so there are only general small business tips we can offer for this one. The best advice is to be as competitive and reliable a seller as possible, thereby giving yourself a chance to appear there. This is one of the key measures we recommend that you take when it comes to setting up your company, product, brand and profile on Amazon. Fulfilment by Amazon – FBA – means that Amazon packages your products and ships them for you. There are certainly arguments for packaging and posting items yourself without paying someone else to do it, but like DIY, refurbishment, hiring moving men and renovations, it’s usually easier to have someone else to do the heavy lifting for you. This is particularly true when your supplier lives half way across the world and you are shipping to somewhere equally far-flung, and if your product(s) are successful you will also be relieved once those thousands of orders start flying in! Amazon has its own internal advertising system for you, but by diversifying your channels and advertising on other major platforms as well you are likely to gain more exposure. Facebook Ads, Google Ads, Twitter and your own online storefront are just some of the other channels you should consider advertising on. Amazon has been known to alter its guidelines in ways that are not beneficial to sellers, so diversifying your channels also helps combat this and future-proof your Marketplace page’s exposure. What tactics do you use when selling on Amazon? Have any of the tactics we have listed proven successful or failed to bear fruit for you? Let us know in the comments!